Can you believe we’re already in Week 7 of the 10-Week Digital Photo Organizing Challenge? 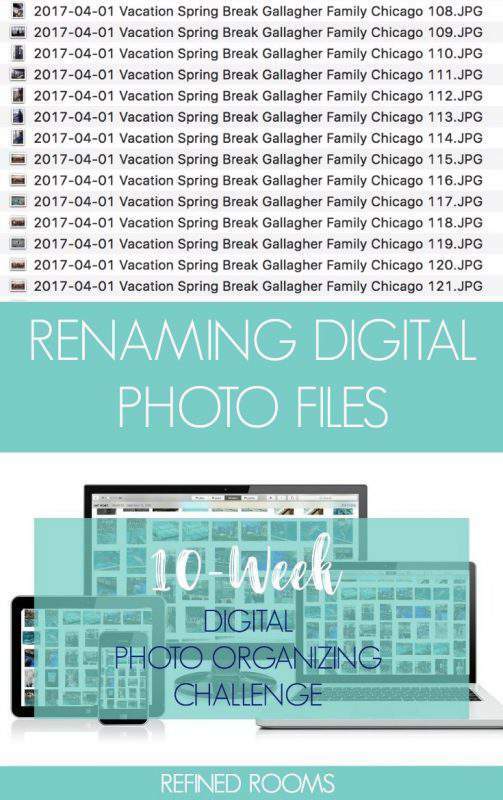 Get ready to break out your jazz hands friend, because this is the week week when MAGIC happens as we rename digital photo files! During my days as a photo organizer, it was at this stage in the organizing process that I LOVED to demonstrate the power of using a descriptive name for image files to my clients. When that lightbulb moment happened — when clients understood how much easier it would be to actually find the photos they were looking for — it was life-changing for many of them. Truly. Some of you might be wondering why you need to bother with this step, since you plan to use tags, keywords, and/or albums within a particular photo organizing software program to organize your images. 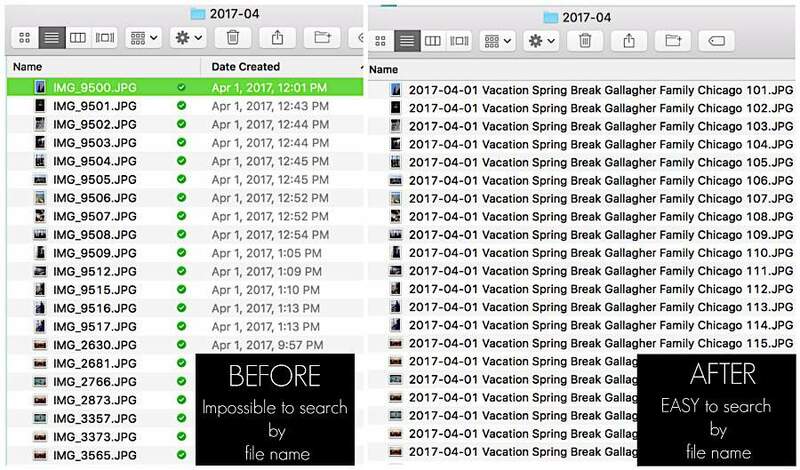 Remember back in week 4 when we talked about the importance of creating a digital photo organizing system that is universally “portable” (i.e., the core file structure system)? I never want to be held hostage by a particular photo organizing software program. This can happen when you’ve created an organizational infrastructure within a program that doesn’t “play nice” (i.e., your organizational structure only works within the confines of that particular program). If this software company goes out of business in the future, or you find something better that you’d like to migrate your collection to, you are basically up a creek and will have to begin all over at square one. I’ve seen it happen to others. Don’t let it happen to you! I begin my file name with the 4-digit year, followed by a 2-digit month and 2-digit day, using a dash (-) between each number. By starting your file name with YYYY-MM-DD, your files will always sort in date order. Follow the date with a theme that tells you the general category of event captured within the image. Common themes in my collection include: Vacation, Birthday, Holiday, and Swim Meet (yours are likely different!). I like to include the names of key people captured in each image in my file names. Everyday photos of my individual children will include the child’s name in the image name. When I have a series of family vacation or holiday photos, I prefer to use our family name in the image. I also like to include a descriptor of where the image was taken as part of my naming convention. This could take the form of a city name, person’s home, or vacation attraction (e.g., Cedar Point). I choose the location based on how I’m likely to search for the image in the future. 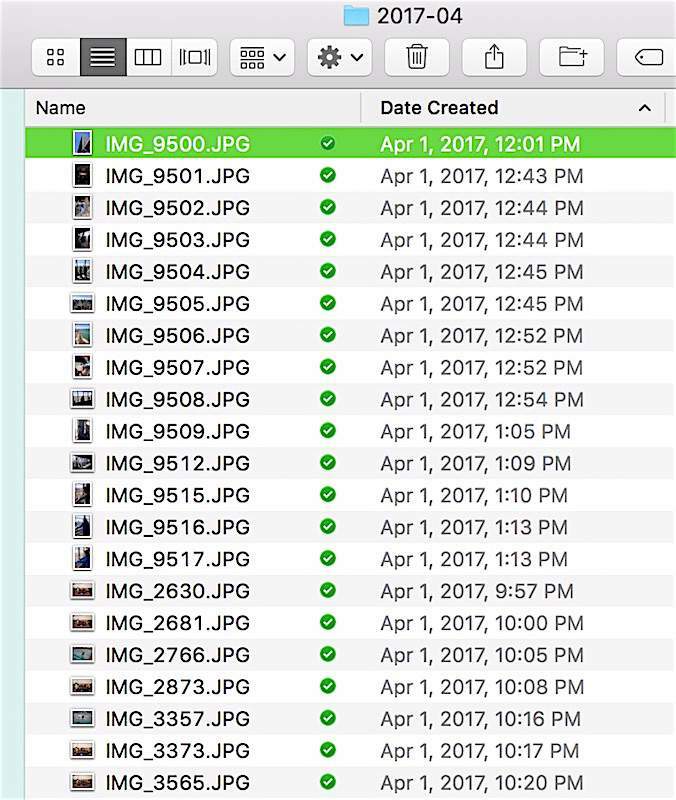 As you can see in the image below, I batch rename a series of images of the same event with the exact same file name and append a unique numerical identifier at the end of the file name (I’ll begin with either 101 or 1001, depending on how many images I have in that particular event). Before I complete the batch renaming for an event, the first step in the process is to sort the images contained within a monthly folder (in the core file structure) in ascending order by date/time created. After completing this crucial first step, I then perform the batch rename, including the unique numerical identifier at the end of the file name. 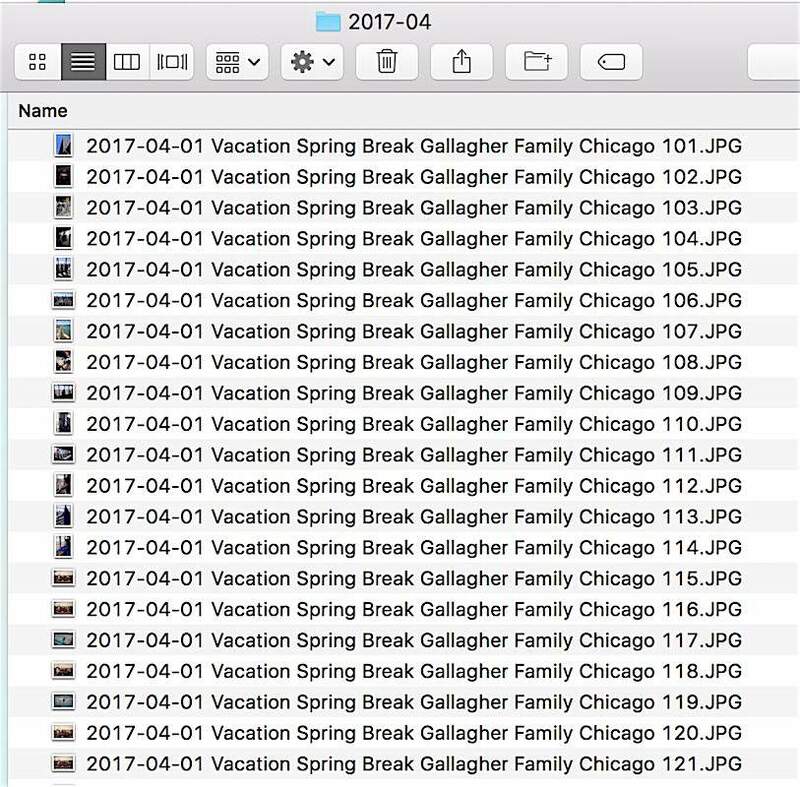 By following this process, I create a unique file name for each image in my collection. Also, the images within a particular event remain in the order in which they were taken during the event. Once you’ve completed the batch renaming process using your descriptive naming convention in a consistent way, I bet you’ll be able to search for ANY image and retrieve it in a matter of a few seconds. See…what did I tell you? It’s MAGIC! 5. Use the SEARCH function on your computer to locate specific images and time how long it takes you; then share the time with me in the comments section of this post! Be sure to return later in the week to let me know about your progress via the comments section, Facebook, or Instagram (use hashtag #DPOChallenge). 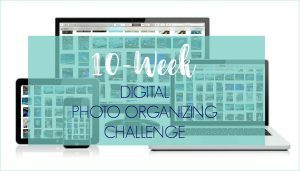 I’ve created a free companion resource for Challenge participants, the Digital Photo Organizing Tool Kit. Just enter your information in the form below, and the Tool Kit will be sent straight to your inbox! Let’s get those photos organized! How do you add in a person’s name? So for example if you did the vacation pictures do you add “John” at the end of it if it’s a particularly good picture of someone? I like the idea of being able to quickly find pictures of a person when doing Birthday or retirement videos. Either method works. I choose #2 in order to avoid having super long file names. Check out this post to learn more about using tags. I actually keep a post-it note on my computer monitor to remind me of my standard file name structure for photos. Even though this is what I “do”, sometimes I forget so having a cheat sheet really helps. Also, I completely agree with not being held hostage by specific photo organizing software for naming your pictures. The native file structure on PC and Mac is generally sufficient. Thanks for the great info!